Description: This new volume includes ten original essays that demonstrate clearly how common, varied, and significant the phenomenon of supplementation in the Hebrew Bible is. Contributors examine instances of supplementation that range from minor additions to aid pronunciation, fill in abbreviations, or clarify ambiguous syntax, to the far more elaborate changes such as interpolations within a work of prose or in a prophetic ot legal text. Scholars also examine supplementation by the addition of an introduction, a conclusion, or an introductory and concluding framework to a particular lyrical, legal, prophetic, or narrative text. Contributors: Marc Brettler, Angela Roskop Erisman, Anja Klein, Reinhard G. Kratz, Sara J. Milstein, Christophe Nihan, Saul M. Olyan, Thomas R�mer, Konrad Schmid, Jacob L. Wright. 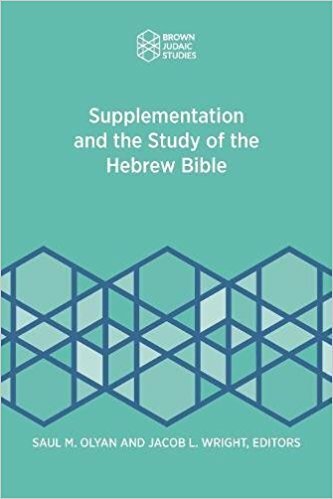 Citation: Marko Marttila, review of Saul M. Olyan and Jacob L. Wright, eds., Supplementation and the Study of the Hebrew Bible, Review of Biblical Literature [http://www.bookreviews.org] (2019).